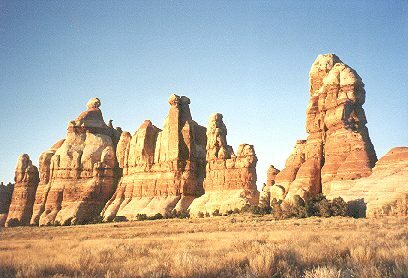 These sedimentary rocks deposited during Pennsylvanian-Permian time as well as during Triassic-Jurassic are on the north end of the Monument Upwarp, a great oval heave which continues down into Arizona. The upwarp began to erode about ten million years ago. 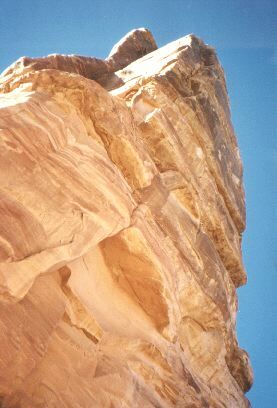 Bedsare composed of Cutler-Cedar Mesa Sandstone, of coastal-marine origin, found in deposits up to 1200 feet thick. Formed of beach and sandbar sand left by a sea invading from the northwest, thissandstone is exposed over vast areas of Canyon Country. White bands are composed of relatively pure sand left by beaches, dunes or offshore bars. Red layers are land sediments rich in iron oxide washed over these areas by fresh water streams. The pinks and oranges in these rocks are due to varying amounts of iron oxide minerals. The presence of iron in this form indicates that the climate was hot and dry when this rock was deposited, whether by wind or water. Each atom of iron and oxygen originally precipitated out of previous generations of stars. surround the high grassy plateau of Chesler Park. We camped in the trees at the foot of the rocks to the right. 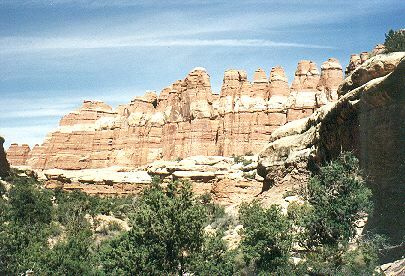 Looking out over eroded sandstone beds which comprise slickrock country, the laccolithic La Sal Mountains looming above the plateau to the northeast. 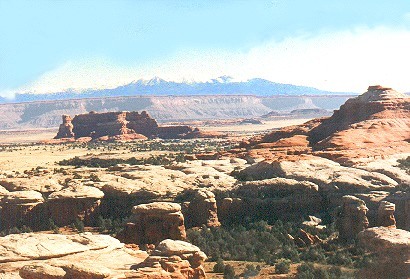 Canyonlands is located in the Colorado River Basin. The Colorado River Gorge is a thousand feet lower than the golden plains stretching before us and the water runs two thousand feet below the canyon rim. Some of these images were etched in over 2000 years ago. 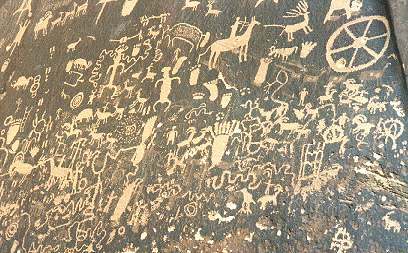 Petroglyphs cut into desert varnish expose the lighter sandstone beneath.